"A war rages in today's workplace, pitting company against company in the fight to find and keep good employees. The losses are high, and battle-weary managers are desperate for talented reinforcements. They've learned that bonuses, stock options, and other financial rewards aren't enough. To win this "war for talent," they need more. Help has arrived in the form of "Keeping the People Who Keep You in Business". This compelling new book gives readers a battle-plan for victory, offering 24 strategies for retaining valuable people. The strategies are grouped in four basic "keys": be a company people want to work for; select the right person in the first place; manage the joining-up process; and, Coach to maintain commitment. These practices will help readers: make their organization an "employer of choice"; clearly define the talent needed; make new employees feel welcomed, valued, prepared, and challenged; facilitate employees' career growth and advancement, and more. 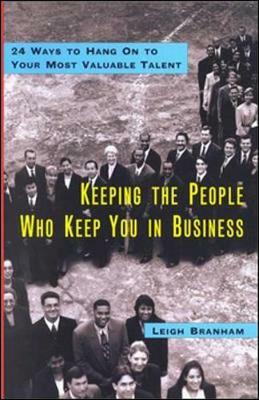 "Keeping the People Who Keep You in Business" is also loaded with specific examples, how-to guidelines, models, and planning aids - proven tools from an expert who knows that money alone won't keep the employees you can't afford to lose".